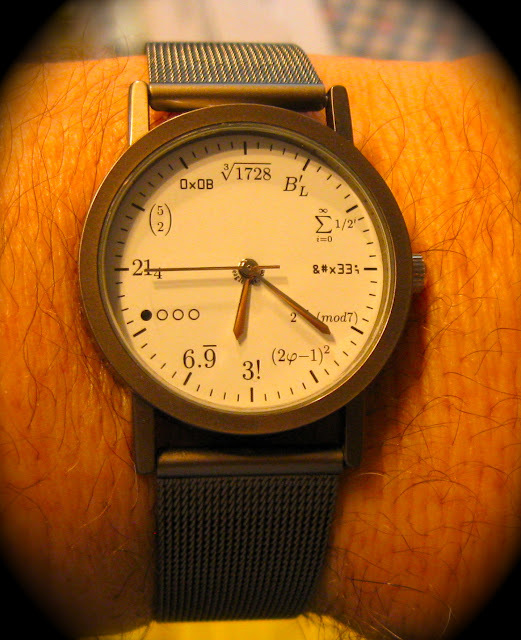 Now, this is a watch! where ln(n) is the natural logrithm of the number n, and is equal to the number of prime numbers less than the number n.
~ And the difference between these two numbers is some really deep math. Not the least of which (to me) is how to get that limit to go to 1 given the approximation that follows it. (2 O’Clock) The sum comes out to be equal to 2. If you think about adding one to one half to a quarter to an eighth to a sixteenth and so on that does come out to be precisely two (in the limit). We must take the positive root since is positive. So now what does come out to be? (8 O’Clock) “ ” This notation can be thought of as being binary where the symbol “ ” is a one and the symbol “ ” is a zero so we have for the number eight the binary number: “ “. This is converted to base ten the way all numbers are converted from one base to another. And that method is to notice that when writing down digits to represent numbers we use a system that gives the digits different values depending on their position. For example the number ninety nine in base ten is just two “9” digits side by side, written “99”. The first of these digits, the one on the right, does represent the number or to be more precise (or one times nine since ten to the zero power is one) while the second of these digits represents the number (or ten times nine which is ninety). So the arithmetic “ ” gives ninety plus nine which comes out to be ninety nine, as we expect to get with two nines stuck together. If there were three nines side by side the left most would be the number or one hundred times nine, the resulting number would be nine hundred ninety nine. When working with a different base (other than ten) we do the same thing except to convert from that base to base ten we use that number base instead of ten. For example what would (or one thousand base two) be if converted to base ten (hopefully the number eight). (9 O’Clock) – This is interesting because on a 24 hour clock 2100 is 9PM. And if you refer back to 8 O’Clock you can see how to convert twenty one base four to a base ten number, and get nine. (10 O’Clock) the binomial coefficient “Five Choose Two” or the number of two element subsets of a set of five objects. Another way of saying this is to say how many ways are there of choosing two things from a group of five things without accounting for order and without replacement. The bit about not accounting for order means if you choose object three and four that is the same as choosing object four and three. So when you think about, how to choose two things from among five you first choose one thing and there are five possibilities. Next you choose a second thing and there are four objects remaining. So for each of the five choices of the first thing there are four choices for the second thing. This gives twenty ways of choosing. If you do not account for order then there are one half as many since choosing thing three then thing four is the same as choosing thing four then thing three. (11 O’Clock) – This is a hexadecimal number (base 16). When you count by a different number base you always reach the number ten when you get to the base. For example in base the numer that follows nine is ten. And this number is always written as the number stuck to the number , or (see how to convert from one base to another and positional value above for why a one and a zero are chosen for the numer ten. If you count in some number base that is greater than ten then you have extra digits before reaching . It is customary to give these extra digits letter values. So for example the digits for base sixteen are and following is the number base or . To distinguish base sixteen from other bases the prefix is traditionally given indicating base sixtee. Going through the list we see that eleven base sixteen is written as expected.